We are Buzzing! Huge pollinator win for Clonmel Tidy Towns. Clonmel has won the top Pollinator Award at the TidyTowns awards on Monday September 24th, at the Helix in Dublin, recognising all that has been done by the town to help pollinating insects. One third of our 99 bee species are threatened with extinction from Ireland. This is because we have drastically reduced the amount of food (wildflowers) and safe nesting sites in our landscapes. The All Ireland Pollinator Plan was launched in 2015 as a shared plan of action to try to reverse these declines and work with communities, businesses, parks, schools and farms to make an Ireland where pollinators can survive and thrive. The Local Authority Pollinator Award aims to encourage TidyTowns groups to implement pollinator-friendly actions in their towns and villages as part of the TidyTowns competition. It supports the All-Ireland Pollinator Plan and is co-ordinated and sponsored by the Heritage Offices and Biodiversity Offices of Local Authorities across Ireland, in partnership with the National Biodiversity Data Centre. There were 66 entries, from 22 counties, for the Pollinator Award this year and the standard of entries was extremely high. To take home the top prize, Clonmel adopted a whole-town approach, mapping the town and pinpointing areas that could act as refuges for pollinating insects, to provide food and shelter. 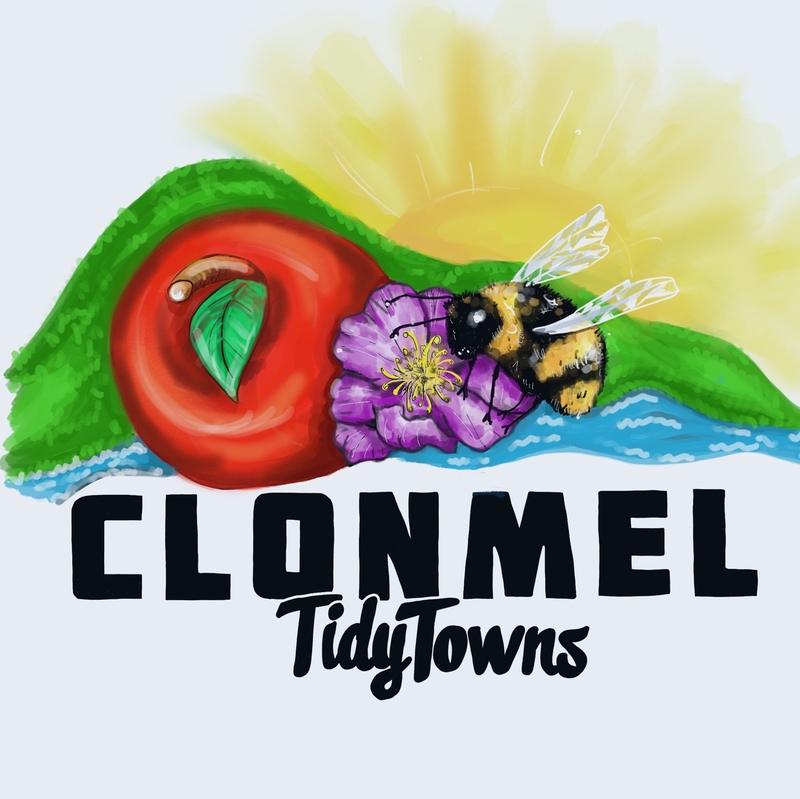 Clonmel Tidy Towns were commended by judges for working with all sectors in the town to raise awareness of the plight of pollinators and how the local council, businesses, home-owners and schools could get involved. The Tidy Towns Committee worked closely with Clonmel Borough District Council to identify and protect existing pollinator-friendly features such as native flowering hedgerows. They also preserved existing pollinator-friendly areas in parks and council lands and helped to keep these pesticide-free. They distributed the Pollinator Plan’s ‘Business guidelines’ to local businesses to encourage them to sign up as plan partners, and worked with Clonmel Men’s Shed to produce signage to help identify pollinator-friendly sites. Working with the Men’s Shed and other Community groups such as SuirCam and 2CanDo, they planted a ‘Community Orchard’, and amazing way to both help pollinators and also provide free fruit for the community. The TidyTowns group took on the admirable chore of manually weeding kerbs, roundabouts and flowerbeds in the town centre so as to avoid using pesticides, and stone walls and soil banks were protected as nesting sites for solitary bees. They also promoted the ‘Garden guidelines’ and circulated a ‘Pollinator-friendly guide for estate management’ to local Residents’ Associations so that private gardens, roadside verges and green areas could all be managed with pollinators in mind. They visited local schools to raise awareness of the importance of pollinating insects as well as planting pollinator-friendly flowers with the children in local parks. Commenting on the special award, Joe MacGrath, Chief Executive of Tipperary County Council said “Clonmel Tidy towns have been committed to pollinators and improving their biodiversity actions for a number of years and I am delighted to see their work acknowledged with this award. Tipperary County Council, through the Clonmel Borough District. is very happy to continue working with them and others in the town to build on their success in this area”. Seven other regional Pollinator Awards of €1,000 were also presented to Ennis, Sneem, Tullahought, Buncrana, Killeshandra, Swords and Geashill. Next postHoney, there is some buzz in Clonmel!